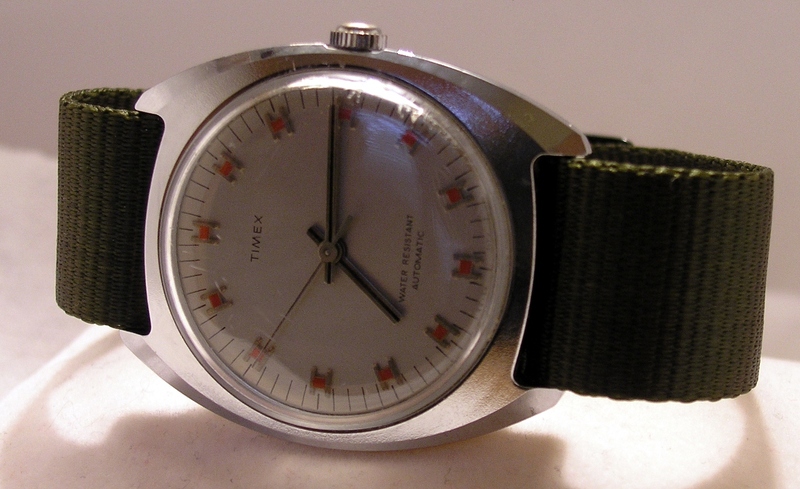 As part of my expanding vintage watch collection, I have added a Timex Automatic watch from 1973. It has a nice mid seventies look to it, complete with pillow shaped case and abstract styling. 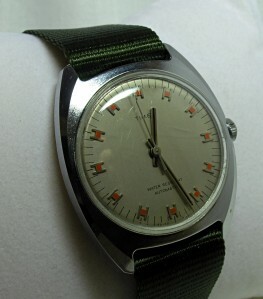 The dial is a gray metallic with ‘H’ shaped markers with a splash of red on the cross part of the ‘H’. It has no day feature. The hands are stick with a wide, easy to see black stripe going down the center of the hour and minute hands. The case is 34mm diameter without and 36mm diameter with the crown, but it looks larger than it is due to the pillow shaped case. The lugs are 19mm. Movement wise, it is an ordinary 31 movement from 1973. Automatic with hand winding, no date. The power reserve is quite impressive so far, with lasting over 2 days in the watch box before stopping. This indicates a movement in very good shape, since it is accurate and has a long reserve. When movements need service they will run fast (counter-intuitively) and have poor power reserve. Overall, I am very happy with this watch. It is attractive and contemporary looking without having too much seventies funk. The watch was probably worn rarely, since the crown has little wear and the watch is in overall excellent shape, with no wear through on the plating. I currently have it on a military style nylon strap, which brings a little more color and character to the watch. Case: 34mm, base metal with chrome plating. Back: Stainless, Marked Water Resistant, Self-Winding, Dust Resistant,CHR plate over base metal. Crystal: Acrylic with a light dome. Movement: Automatic with hand winding, Timex no-jewel pin lever escapement. Caliber 32, 18000 BPH. Other: Currently on nylon band. This entry was posted in New Watches. Bookmark the permalink. Hi, I love this watch. Would you consider it for sale? It all depends on what the offer is. You can e-mail me: contact at cyberphreak dot com. do you still have this watch? Would you be willing to sell it? What is it about this watch? Everyone wants it. $100 on nylon, $120 on new leather, $95 with no band+ shipping and handling. I sent you an email the cypherphreak address to see if you were still had it and were interested in selling it at the above price – would love to know – thank you! At this point the watch is not for sale. It is one of my favorites and my only gray watch, the “in” color for this season. Hey I have a timex 46150 with a metal elastic band, are you interested in buying? Anyone Have This Watch For Sale?